Mark asks: Who invented spoons and forks? Spoons are one of the oldest eating utensils on the planet. This isn’t particularly surprising if one considers that nearly as long as humans have needed food, they’ve required something to scoop it up with. Unlike knives and forks, that for the most part needed to be fashioned, natural spoons could be utilized by employing such things as seashells or conveniently shaped stones. Sure, the earliest known instances of these didn’t have handles yet, but from these humble beginnings, the spoon was born. There is no definitive time period that can be attributed with the invention of the spoon. And by ‘invention’ I of course mean ‘adding a handle made from some dead animals bone.’ However, archaeological evidence suggests that spoons with handles were used for ancient Egyptian religious purposes as early as 1000 BC. Made from materials such as ivory, wood, flint and slate, these spoons were covered in ornate decorations and hieroglyphics. When it came to actually consuming food, the most common material at the time for spoons was wood due to its availability and low cost. However, during the Greek and Roman empires, spoons made of bronze and silver were commonplace among the wealthy. This remained true up to and through the Middle Ages. In fact, the first documented evidence of spoons in England was in 1259 – it was counted as an itinerary item from King Edward I’s wardrobe. Similar to the Egyptians, spoons at this time were not merely used for eating, but also in ornate ceremonies and to demonstrate wealth and power. For example, the coronation of every British king was preceeded by a ritual where the new monarch would be anointed by a ceremonial spoon. Spoons were granted even further importance during the Tudor and Stuart periods when it became customary to give an Apostle Spoon as a christening gift. The particularly wealthy gave a set of twelve of these spoons, and eventually a thirteenth was added. This was called the “Master Spoon”, as it bore the figure of Christ. This practice gave birth to the tradition of christening spoons and was prevalent throughout all societal classes at the time. The only difference was the material from which these spoons were made – typically silver or gold for the upper classes and copper or brass for the lower. The design of the spoon changed throughout the Renaissance and Baroque periods before finally receiving its current mostly standard look around the 18th century. Since then, spoons have continued to be a staple of modern tables and come in a wide array of variations – everything from soup to caviar spoons. The most recent addition to the common cutlery club is the fork. Although they have technically existed since ancient times, these preliminary specimens consisted of a mere two prongs and were used primarily for cooking and serving food. Fingers, spoons and knives were still the most popular choices when it came to actual eating. 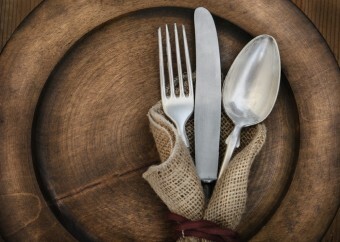 Some of the earliest known table forks made their debut in Ancient Egypt. The Qijia culture (2400-1900 BC) that resided in part of present day China also are known to have used forks. A couple thousand years later, the fork’s popularity in the Western world spread via the Silk Road into Venice. One of the earliest recorded evidence of forks in Venice is from an 11th century story of the wedding of a Byzantine princess, Theodora Anna Doukaina, to Domenico Selvo. She supposedly brought gold forks as part of her dowry. When the princess died two years later of a mysterious degenerative disease, it was considered by some to be punishment for her pride and perceived excesses. What the fork? Despite being mentioned as OK to use in the Hebrew Bible, forks in the Western world continued to carry this negative stigma due to their association with Eastern decadence and being perceived as an affront to God. They were subsequently strictly reserved for sticky food. The fork’s popularity began to grow during the 16th century due to the infamous historical trend setter Catherine de Medici. She helped popularize the fork (as well as pasta, olive oil, chianti and the separation of sweet and savoury) with the French tables after her marriage to Henry II. At this time, anything Italian was in vogue thanks to the Renaissance. The fork also became more popular as hygiene ideals began to change. Up until this point, purposely clogging one’s pores with dirt to prevent the plague infiltrating through them was considered a good idea. (Similar thought processes were largely why bathing was uncommon during Medieval times– you don’t want disease filled water getting in your pores!) Many people also preferred to blow their noses directly into their hands instead of onto the tablecloth, as that would be bad manners. Now, imagine these same people eating with their hands. By the 18th century, curved forks with tines were increasingly used in order to defeat food such as peas. People would also carry around their own personal cutlery sets, though forks were still primarily used by the upper classes. It wasn’t until a hundred years later during the Industrialization period that the lower and middle classes began commonly using forks also. Commoners even began to be able to afford to have entire cutlery sets to offer guests – some even matched! Forks quickly surpassed knives as the most popular cutlery item which resulted in the Victorians creating an overabundance of fork varietals. You can thank them next time you’re spearing some juicy lobster meat with one. Since then, the fork has remained a staple in Western society. Knives have dually been utilized as both a weapon and an eating implement since prehistoric times. This is quite logical – you kill your food and then cut it into conveniently sized pieces with one handy tool. However, knives weren’t domesticated or fashioned exclusively for table use until the Bourbon Dynasty in France. Up until this point, they were typically incredibly sharp due to their aforementioned use in killing one’s food. As such, the presence of knives at a table posed a constant threat. It’s important to remember that this was also an age where a significant source of hydration came from wine and ale. Therefore, it wasn’t uncommon for the particularly inebriated to accidentally puncture their mouths whilst trying to eat their food. Of course, when forks began gaining in popularity during the Middle Ages, this resulted in less of a need for a pointed knife during meal times. As such, in 1669, Louis XIV- the same guy who loved doing up his hair and wearing tights and high heels as was the manly fashion at the time- made these overly sharp knives illegal at the table and replaced them with blunter / wider ones. This has for the most part remained the norm up until the present day, though the standardized stainless steel variety weren’t introduced until around the 20th century. Inebriated diners might do more than injure their mouths with a sharp knife. It is my understanding that the blunting of the table knife was to keep it from being used as a weapon against the host. The so called “right hand man” sat at the host’s right because it was a position that made the host vulnerable to having his weapon hand seized. Only a trusted ally would be allowed to sit there. Finally, much of eastern Asia uses chopsticks, and there are no knives in the dining area. The cutting is done in the kitchen, keeping potential weapons out of the hands of diners. It’s good to read about things like “forks” being an instrument of the Devil and the logic behind it. It gives us perspective on the other silly devil related habits and tools of our modern times.